A team of researchers from the University of Florence, Consorzio Interuniversitario per lo Sviluppo dei Sistemi a Grande Interfase and Paper Conservator has developed a new type of hydrogel for safely removing pressure tape from paper. 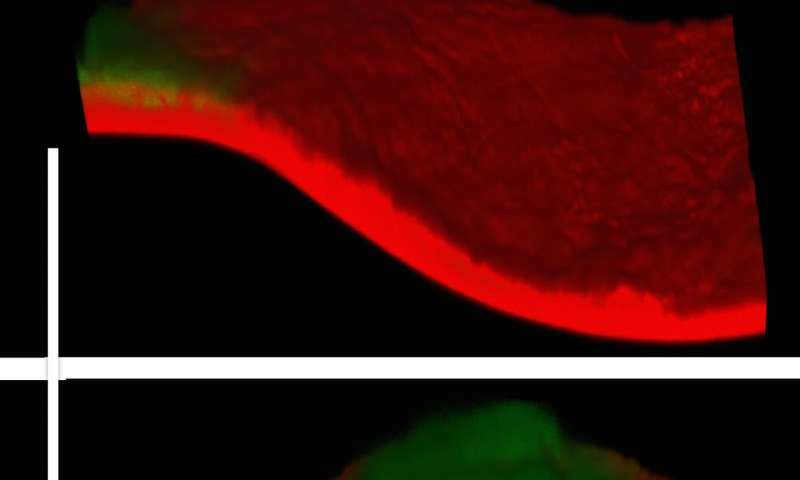 In their paper published in Proceedings of the National Academy of Sciences, the group describes developing the gel and using it to remove a stretch of tape from a centuries-old paper drawing. As the researchers note, in the interest of preserving paper-based forms of art, preservationists in the past used tape to repair torn pieces. But in the interest of restoring old pieces of art to their original state, conservators have taken to removing tape and other bindings to reveal anything hidden beneath them. In this new effort, the researchers were confronted with a length of tape that had been applied to the bottom of a piece of paper upon which someone had drawn a picture. The picture was a reproduction of a scene from Michelangelo's Sistine Chapel. The drawing was dated to near the time of the famous painter. The paper had come into the possession of a collector who wanted to have the strip of tape at the bottom removed. The tape, it was noted, was modern. To remove the tape, the researchers turned to hydrogels, as they have recently been found to be useful in other art restoration efforts. To make their gel, the team started with a clear gel and added solvent molecules which were suspended in a matrix as the gel hardened to a rubbery form. The result was a sheet of hydrogel that could be cut to size. The team cut one such sheet to just cover the tape at the bottom of the page holding the drawing—they let it sit for a while as the gel dissolved the adhesive material in the tape. They then were able to peel off the tape with ease. 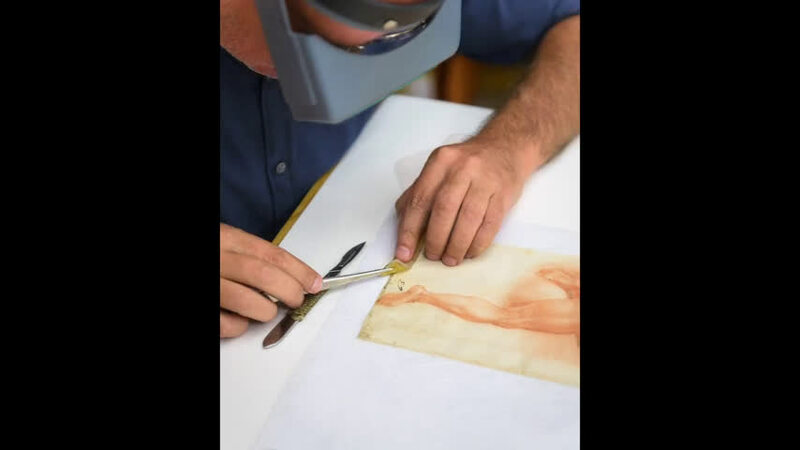 After removing the tape, the team discovered that it had concealed a simple hand-written statement, "di mano di Michelangelo" which translates to "from Michelangelo's hand." The researchers do not believe the statement was true, which was why someone had concealed it with the strip of tape. They do plan to conduct more research, however, to learn more about the history of drawing. The presence of pressure-sensitive tapes (PSTs) on paper artworks, either fortuitous or specifically applied for conservation purposes, is one of the most frequent and difficult issues encountered during restoration. Aged PSTs can damage or disfigure artworks, compromising structural integrity, readability, and enjoyment. Current procedures are often inherently hazardous for artistic media and paper support. 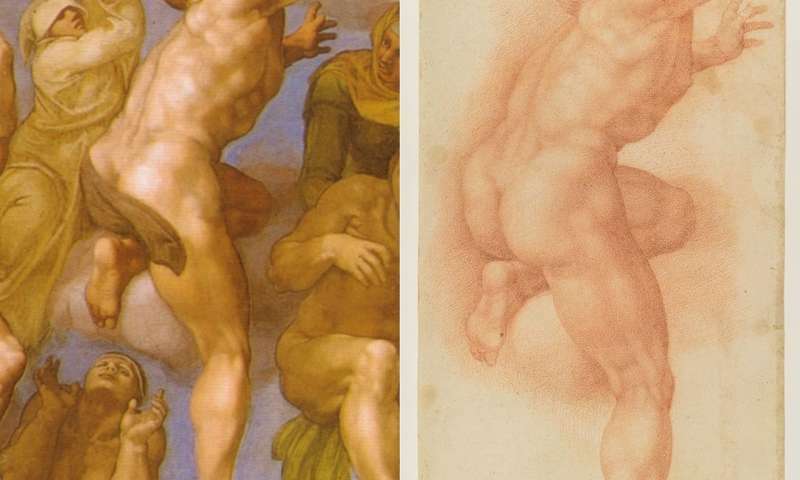 Challenged by the necessity to remove PSTs from a contemporary and an ancient drawing (20th century, by artists da Silva and Hayter, and a 16th century drawing of one figure from the Sistine Chapel by Michelangelo), we addressed this issue from a physicochemical perspective, leveraging colloid and interface science. After a characterization of the specific PSTs present on the artifact, we selected a highly water-retentive hydrogel as the host of 23% wt/wt of "green" organic solvents uniformly dispersed within the gel in the form of nanosized droplets. The double confinement of the organic solvent in the nanodroplets and into the gel network promotes a tailored, controlled removal of PSTs of different natures, with virtually no interaction with the solvent-sensitive artwork. This noninvasive procedure allows complete retrieval of artwork readability. For instance, in the ancient drawing, the PST totally concealed the inscription, "di mano di Michelangelo" ("from Michelangelo's hand"), a possibly false attribution hidden by a collector, which is now perfectly visible and whose origin is currently under investigation. Remarkably, the same methodology was successful for the removal of aged PST adhesive penetrated inside paper fibers of a drawing from the celebrated artist Lucio Fontana.